Marriott International Inc. today announced it has signed an agreement with Melbourne-based property development company Capital Alliance to introduce the AC Hotels by Marriott® brand to Australia. The 200-room AC Hotel by Marriott Melbourne Southbank will open in 2020 as part of a dynamic mixed-use development. 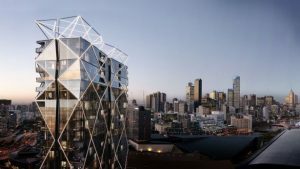 The hotel marks Marriott International’s second major hotel deal with Capital Alliance, with Melbourne Marriott Hotel Docklands currently under construction, and underscores the hospitality company’s growth in Australia. AC Hotels was born from the vision of renowned hotelier Antonio Catalan, who founded the brand in 1988 and grew it into one of the most successful and highly-regarded hotel companies in Spain. Following the brand’s success in Europe, a joint venture was formed with Marriott International in 2011 to launch AC Hotels by Marriott. Based on a belief that purposeful design can enrich lives, AC Hotels by Marriott celebrates classic modern design that is inspired by the urban locale and the brand’s Spanish roots. The AC Melbourne Southbank will be located in Normanby Melbourne, a 40-storey mixed-use building that will feature high-end apartments, dining venues and shopping in the heart of Fishermans Bend, an up-and-coming neighbourhood near Melbourne’s city centre. Guestrooms will offer sweeping views of the city skyline and Yarra River. True to the brand, the hotel will feature a range of collaborative spaces, including the AC Lounge, a modern co-working space for creative gatherings by day and a buzzing social hub offering European-style tapas by night. The hotel will also offer a range of leisure facilities, including an outdoor, infinity edge, swimming pool spanning the width of the building, a 24-hour fitness centre and three food and beverage outlets including the AC Lounge. Meetings and events organizers will be able to take advantage of 150 square metres of space designed to welcome groups of all sizes. “We are really excited to partner with Marriott International to bring a new hotel to Fishermans Bend. We believe in the potential of this area, just as we believed in Melbourne Docklands, and it’s great that Marriott International shares our confidence. Just a stone’s throw from the city, Fishermans Bend is going to redefine inner suburban living and the AC Melbourne Southbank will attract sophisticated and discerning travellers to the area,” said Mohan Du, Founder and Chief Executive, Capital Alliance.